Last week I offered some thoughts and questions on how we might evaluate liturgical music (and other aspects of our public worship) by considering the fact that, as Pope Pius XII taught, “the entire liturgy . . . has the Catholic faith for its content” and that this content includes, as one of its most precious components, the mystery of the awesome sacrifice of Calvary made present in the Most Holy Eucharist. Let us continue to take up the teaching of Pius XII’s Meditator Dei as a way of reflecting on what music is most suitable for such a humbling and exalted honor in our Christian life as our assistance at and participation in this divine sacrifice. We must admit it: when reading these words of Pius XII, it is as if we are looking at another world, not just another decade or era. When is the last time you have met someone who is concerned to “abhor any profane influence”? Catholics today so readily compromise their faith, morals, and worship by prostituting themselves to the latest fashion that it seems they are rather more eager to embrace the profane in all of its vanity than to reject it for the poison it is. Far from abhorring the profane, they court it, embrace it, and submit to it, making what ought to be a badge of shame into the boast of a new identity and mission. Indeed, a popular (though largely tendentious) interpretation of Vatican II has presented it as the moment when the Church finally welcomed the world into her bosom and discarded, once and for all, the ascetical divide between sacred and secular: there was to be no such thing as sacred liturgy, because all the world is our new liturgy, all of it is blessed by God, and the Church has only to listen, learn, and adapt herself to man in order to bring Christ to him. And when is the last time you have heard “nobility” put forward as the general description of the aim of human arts and skills, when these are brought into the service of God? Nobility—the pursuit of the utmost excellence, tasteful beauty, integrated virtue—should be the single word that captures the essence of the Catholic attitude and mentality, the single word that should sum up the tone of seminary education in catechetics, homiletics, dogmatics, morals, and, above all, liturgy. It is, unfortunately, hard to resist the impression that the cult of the ugly, the compromise of the ignoble, and the toleration of the casual and the slipshod are instead the prevailing traits. Last but not least, is there universality still left, when the ever-malleable and evolving popular inculturated liturgy, burdened by the disease of optionitis, makes every community one visits a new sociological experiment as to the meaning of ‘Catholic’ in this or that town, diocese, or country? As a friend recently pointed out to me, many Catholics have no assurance of either universality or stability: even if their parish has done the liturgy nobly and beautifully for many years, the whole thing can be undone overnight by the next cleric in charge—and, regrettably, almost all of the unwanted changes, deformations, reductions, cancellations, modifications, and novelties can be justified in the name of some permission or other. Let us be clear about this: outside the tranquil world of the usus antiquior and those few communities fortunate enough to enjoy its exclusive use, there is simply no universality, and but little stability, for Catholics of the Roman Rite. 80. 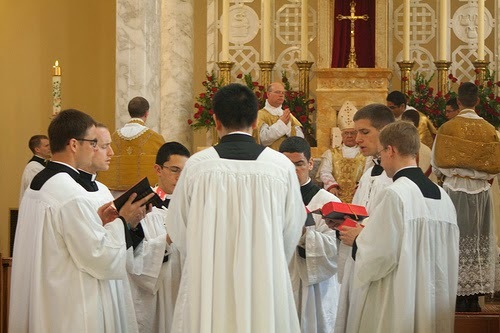 It is, therefore, desirable, Venerable Brethren, that all the faithful should be aware that to participate in the Eucharistic Sacrifice is their chief duty and supreme dignity, and that not in an inert and negligent fashion, giving way to distractions and day-dreaming, but with such earnestness and concentration that they may be united as closely as possible with the High Priest, according to the Apostle, “Let this mind be in you which was also in Christ Jesus” (Phil 2:5). And together with Him and through Him let them make their oblation, and in union with Him let them offer up themselves. Magnificent words! The “chief duty and supreme dignity” of the Christian is “to participate in the Eucharistic Sacrifice.” It is not social work; it is not evangelization or catechesis or education; it is not political activism; it is not breaking down barriers of prejudice; it is not the defense of human rights. Our dignity consists above all in worshiping the true God at His holy altar—and making of ourselves an oblation that is pleasing to Him by attaching ourselves devoutly to the supreme offering of Jesus Christ the High Priest. If this is not what we are thinking and intending to do during Mass, we have missed the entire point of the liturgy. We are doing violence to it, abusing it, making it serve our own ends rather than serving its inherent end. 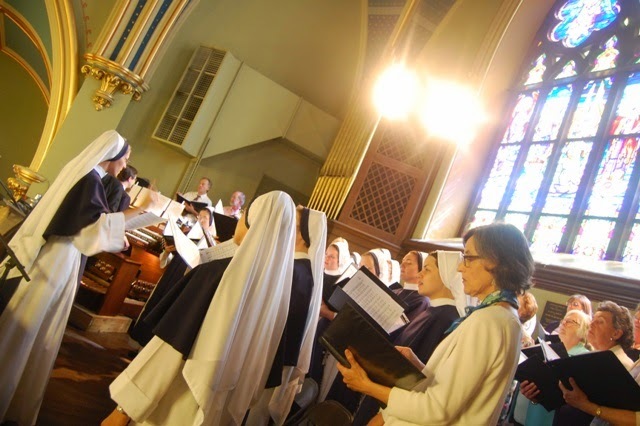 When it comes to music, in particular, we see how often the Mass is sorely abused, inasmuch as a worldly style of music not only permits but encourages “distractions and day-dreaming” that take us far away from the “earnestness and concentration” with which we should be consciously uniting ourselves with the High Priest and saving Victim. Just pondering these words of Pope Pius XII will make us realize how many times the Mass is violently derailed from its very purpose and made to serve a human agenda that is ultimately inert and negligible. No wonder—as many fine priests and bishops have begun openly to admit—no wonder the New Evangelization is looking so wimpy and tending, so far, to be so fruitless. We are spending a lot of our time talking among ourselves about how to make Christianity appealing, attractive, relevant, meaningful, etc., and are neglecting the single most important thing that we are called to do as Christians: worship the Lord in the beauty of holiness, receiving from Him, through our Catholic Tradition, the sacred, noble, universal, and stable forms by which we are to order ourselves and the whole of creation back to their primal font and glorious end. Whenever and wherever Catholics have committed themselves wholeheartedly to this program, and for its own sake, because God is worthy of it, the propagation of the Gospel has taken place quietly, irresistibly, with a joy that is not of this world.